You'll be £10.00 closer to your next £10.00 credit when you purchase The Forgotten War Against Napoleon. What's this? The campaigns fought against Napoleon in the Iberian peninsula, in France, Germany, Italy and Russia and across the rest of Europe have been described and analysed in exhaustive detail, yet the history of the fighting in the Mediterranean has rarely been studied as a separate theatre of the conflict. Gareth Glover sets this right with a compelling account of the struggle on land and at sea for control of a region that was critical for the outcome of the Napoleonic Wars. The story of this twenty-year conflict is illustrated with numerous quotes from a large number of primary sources, many of which are published here for the first time. This is a well written and eminently readable tome that covers a lot of ground concisely. An excellent introduction to campaigns that deserve more attention. The history of the Napoleonic Wars in the Mediterranean, on land and on the sea, is still quite unknown. The work of Gareth Glover is trying to fill this gap. 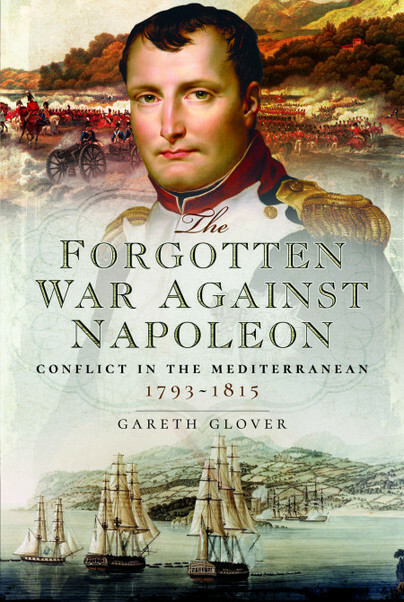 Glover, well know for his extensive writings on the French Wars of 1793-1815 and as the editor of The Waterloo Archive, gives us a comprehensive look at the Mediterranean and adjacent territories, a largely “forgotten” theatre of the very long Anglo-French war. This is an essential work for anyone interested in the British Army during the French wars. Gareth Glover is a well known Napoleonic specialist who deserves our eternal gratitude for editing and publishing many previously unseen accounts. This is not an in-depth study of operations in the Mediterranean, but it does show the importance the British government placed on, and the very significant level of commitment made to, this theatre of operations by both services. It is a very badly needed introduction that hopefully will encourage in-depth studies on key aspects of the Mediterranean war and the publication of more eye-witness accounts. Good to see colour illustrations and a plentiful supply of maps. This is a well researched and well written account of the most complex long term military commitment for Britain during the Napoleonic Wars, involving multiple theatres spread out over a large area, cooperation between the Navy and the Army, an ever changing cast of senior officers, opponents and allies, often made more complex by the time taken to get messages from London to the officers in the field. Gareth Glover, an expert on the Napoleonic Wars (and a former Royal Navy officer) has produced a well-written and fascinating book which will be popular with all those interested in the Napoleonic Wars. An excellent book of naval history, and history in general, strongly recommended to all the cultures and scholars of these fascinating subjects. Purchase recommended to all lovers of the First Empire. For those bored of replaying the sane old Napoleonic, this is an absolute goldmine. I've been cheeky enough to get many of my ideas for the Capri scenario in this issue from this book! When I finished this book I was sorry it wasn't longer. It is a tour de force and reminded me of areas which I now want to revisit and to read more about in greater detail. It is an excellent overview. This book provides a well-researched overview of the numerous actions in the Mediterranean during the period, ranging across Eastern Spain, the South of France, Italy, the Adriatic coastline, North Africa, Egypt, the border regions of the Russian and Ottoman empires. The reader will be inspired to study more extensively those conflicts which have been covered in wider detail by other authors, for instance the Siege of Toulon, the French Expedition to Egypt and Syria, the French invasion of Eastern Spain, the Russo-Turkish War and the Battle of Maida. More ambitious readers may even be inspired to research and produce works on the conflicts which have been less well known or documented, like those involving Dalmatia and the Adriatic coast or the Kingdom of the Two Sicilies. With a good balance between being engaging for a mass audience, whilst also shedding light on a little known topic in a way that will excite and educate academics, this book is thoroughly recommended - written history doesn't get much better than this. Those who enjoyed Mr Glover’s Fighting Napoleon: The Recollections of Lieutenant John Hildebrand 35th Foot in the Mediterranean and Waterloo Campaigns (Pen & Sword, 2017), which I reviewed earlier, will certainly want to read this book to discover the background to his adventures. The campaigns fought against Napoleon in the Iberian peninsula, in France, Germany, Italy and Russia and across the rest of Europe have been described and analysed in detail, yet the history of the fighting in the Mediterranean has rarely been studied as a separate theatre of the conflict. Glover, a former Royal Navy officer, presents an insightful and absorbing account of the struggle on land and at sea for control of a region that was critical for the outcome of the Napoleonic Wars. An important contribution to our understanding of a fundamentally pivotal period in history. Simply put, this is an excellent addition to the Napoleonic bookshelf, which dealing as it does with a relatively unknown aspect of the conflict, is most welcome. Highly recommended.